HARTING has been closely linked to handball for many years. 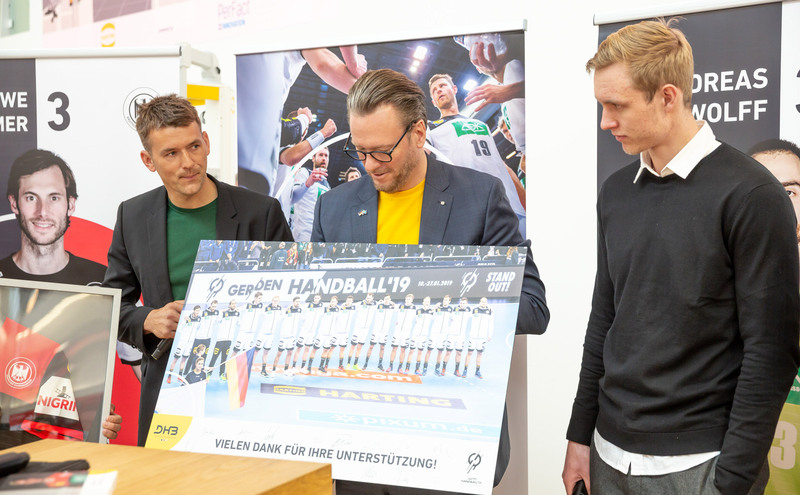 The technology group provides support as a main sponsor of Bundesliga club GWD Minden, became a premium partner of the German Handball Federation (DHB) in 2017, and promotes the national team and the junior teams of the DHB. National coach Christian Prokop thanked the company for its support during a visit to the HANNOVER MESSE trade fair. The coach, together with Jörg Westheider, head of Handball Marketing GmbH of the DHB, and Marian Michalczik, one of the GWD Minden backs and for the national team, were welcomed by Board charman Philip Harting at the trade show stand. Harting recalled the thrilling appearance of the handball players at the World Cup at the beginning of this year. Although the effort was not enough to win a medal, Harting noted that the team in the shorts bearing the HARTING logo at the World Cup are undoubtedly among the best in the world. Christian Prokop has played a large part in this achievement. The 40-year-old, who played for GWD Minden from 2001 to 2003, assumed his role in mid-2017. Under his leadership, the team had re-conquered the hearts of handball fans and made the sport even more popular in Germany, said Harting. Prokop surprised the Board chairman of the family business with a special gift, presenting a jersey with the signatures of all the players on the national handball team. Handball-Bundestrainer Christian Prokop (l.) und Nationalspieler Marian Michalczik (r.) begrüßten auf der Hannover Messe den HARTING Vorstandsvorsitzenden Philip Harting. Christian Prokop and Marian Michalczik, who debuted in the national team in June 2017, then proceeded to answer questions from trade fair visitors, fans and HARTING employees. The national squad trainer and marketing director Jörg Westheider were impressed by the company, its innovative technological products and solutions for a wide variety of applications during a tour of the HARTING stand. Our commitment to sport is demonstrated by our many engagements.